But when you have more than one employee, verbally communicating the way we do things can get muddled. People forget who has been told what, and things that the boss assumes everyone knows, turn out to be conversations that they held with someone who has long left the company. This is where writing your HR policies and procedures down can help. By having them documented and then making them freely available for people to access and read, then you can save time and stop reinventing wheels. If you need to document information into a manual where should you start? Before you work on the details, you need to work out what you want your policies and procedures manual to do for your business and what workplace culture you are trying to achieve. Some businesses want aspirational policies – high-level guidance that allows freedom of implementation. They believe that by taking the rules away, that they give their team members the discretion to implement them as they see fit. For years, Nordstrom was the pin-up company for this sort of approach with their famous 75-word employee manual. Welcome to Nordstrom We’re glad to have you with our Company. Our number one goal is to provide outstanding customer service. Set both your personal and professional goals high. We have great confidence in your ability to achieve them. Nordstrom Rules: Rule #1: Use good judgment in all situations. There will be no additional rules. Please feel free to ask your department manager, store manager, or division general manager any question at any time. This was supported by intensive culture development initiatives to develop a creative and inspirational workforce. It is interesting to note that in recent years even Nordstrom has moved to a more prescriptive approach, with employees now receiving detailed procedure manuals. What many businesses have found is they need more detail in their manuals – providing the underpinning philosophy or rationale for the policy as well as more detailed operating procedures in terms of how each part should be applied in the workplace. Businesses still want to encourage initiative, but they want this initiative to be within clearly defined boundaries. In these situations, a more detailed employee manual is called for. 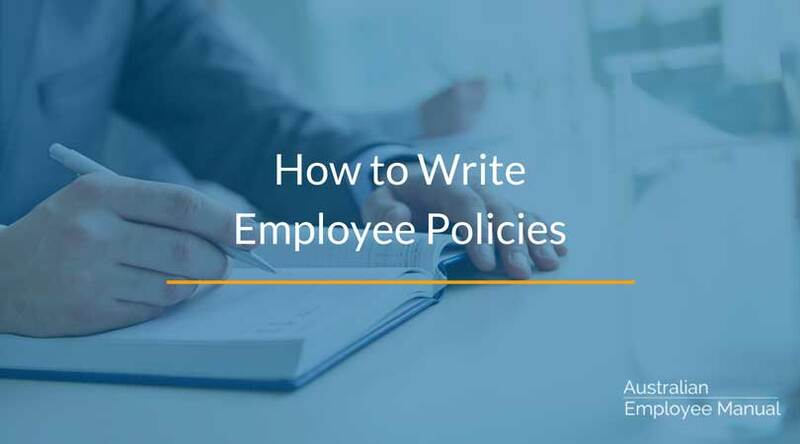 How to Write HR Policies: What’s The Difference Between A Policy And A Procedure? There’s loads of debate about this one, but essentially a policy is a guiding principle (e.g. : we don’t tolerate workplace bullying) and a procedure lists tangible steps or processes by which the policy is implemented. What Do You Need in Your HR Policies And Procedures Manual? If you do something regularly and it is performed by more than one person, then it probably needs a procedure. To choose the areas you need to cover, start with the things that make the most difference and are at the heart of how you want to run your business. Next include the things you need for legal compliance, before looking at “problem areas” within your business. How Do You Write A HR Policy Or Procedure? There are as many different ways to write policies and procedures as there are ways to paint a picture. If your business is quality accredited by an external body, then usually you have very detailed and structured templates for you to follow. These can include requirements to include policies, issue dates and issue numbers, authorising officers, superseded policies and a whole lot of other formal requirements. For most small businesses, HR policy and procedures manuals are more informal. They simply outline what is to be done and by whom. Make sure you include all the steps that are needed to occur and the order in which they are to occur in. This is where input from your team members can be invaluable. If your business is undergoing quality accreditation, then you are obliged to format your manuals in a certain rigid fashion, with the first page and a half of each policy listing out details including version control, person responsible for the policy, who it applies to, delegations, linkages to other policies or legislation, review processes and so on. In my personal experience, this makes policy manuals (which are hard to get people to read at the best of times), almost guaranteed to become a dust collector on a bookshelf somewhere. Yes, you need these details, but if the supporting guff is longer than the actual policy (or if it takes too long to find the answer someone is looking for) then people tend to take action first without reading the manual and worry about the consequences later. The same thing happens if your policies are full of jargon, are very formal in language, or are written with complex words. The temptation for most policy writers is to write in the third person, with formal language all filled with jargon. This totally defeats the purpose. You are writing for humans, not computers. If your policies are drafted by your company lawyer then you can pretty much guarantee your policies will fall into this category. The best policies (meaning the ones that actually get read and actioned) are ones that are simple, easy to understand and conversational in tone. Yes, have your company lawyer vet the words to make sure you have not unwittingly created a legal minefield, but don’t let them change the overall tone of the language. People need to understand what you are asking them to do if you have any hope of compliance. Write directly to the person reading the policy in easy to understand language. For small businesses, it is totally fine to use the word “you” in your policies to aid clarity of understanding. You can also choose to use flowcharts, pictograms or checklists to explain particular procedures, as these tend to also increase understanding and compliance. Many businesses choose to store individual policies or procedures as standalone documents. This works well if you only have a small handful (less than 20). With most businesses, the number of policies that are needed makes it impossible to remember or locate individual policies. Options can include putting them into a content management system with searching capability; having one master index with the individual documents linked from the index; or having one master document with everything included and a detailed index. How you store your information depends on your business. But the harder you make someone search for the information, the less likely it will be that they follow it. You need to make sure that everyone can easily access the information, and should be able to tell you in an instant where to locate a particular policy or procedure. If you specify particular steps you want people to follow, then it pays to convert this into a checklist that is either built into any electronic task management or workflow system you have, or is printed off in hard copy if you are not using an electronic system. There’s no point in having a procedure unless you consistently remind and reinforce that it is to be followed. With a scattered workforce, you need to have your policies in an easily accessible place. For small companies, the old-fashioned printed copies in a binder work well. Once you start getting over about 50 employees, you need to look at company intranets and electronic copies of your procedures to make sure they are easily accessible by all of your team members. Policy and procedure manuals should not exist in isolation. The implementation of the employee manual is as important as the words on the page and needs dedicated time and resources to make it happen. Combine both the words and implementation and you will have a winner. If you want your staff to follow procedures, you need to model this in your everyday actions. For example, if you have a checklist to follow during a new employee induction or orientation, and choose to skip large steps of the process without explanation, you have just told your employee that following the process is an optional extra in your business. If you want compliance – model compliance. Policies and procedures need to be regularly reviewed for currency. At least once a year read through every HR policy or procedure to make sure that the processes are still current, there have been no legislative or other changes that need to occur, that roles identified within the policy still exist, and that any links within the document are current. (It pays to check out sites such as the Fair Work Ombudsman for legislative changes). 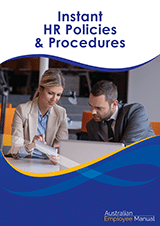 If you would like pre-prepared HR policy and procedures templates for your small business, then check out our Instant HR Policies and Procedures Manual. They are specifically written for small to medium-sized businesses, are fully compliant, and contain HR policies and procedures to match most situations.